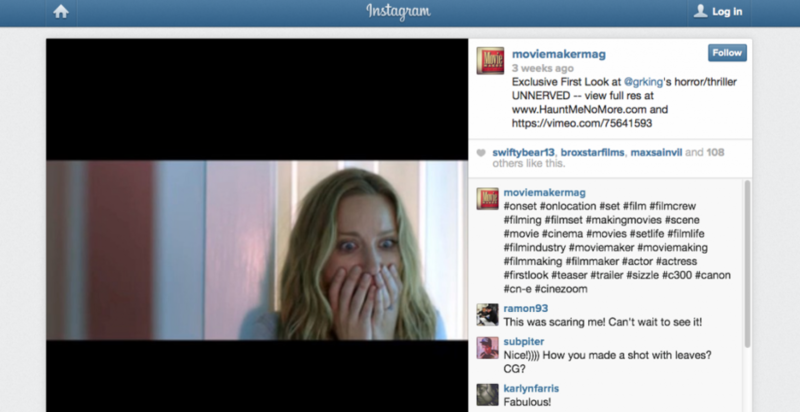 We had the honor of posting images for a week on MovieMaker Magazine's Instagram account while filming UNNERVED in Maine during Sept/Oct. Actor/Producer Mark DiConzo and DP Chad McClarnon thought about making a quick sizzle instead of just posting pictures and it was a great idea -- even if we were only in Week 2 of shooting. Our team felt it was the perfect opportunity to take advantage of its new video function to show off some footage -- which no featured filmmakers on their account had done yet. MovieMaker Magazine even asked us how we did it. It's such a tremendous platform of exposure, we figured why not take full advantage (all 15 secs of it) of what it can do. The sizzle teaser was our last post of the week we were featured.